Recognizing RLEK’s contribution towards the upliftment and empowerment of minority Van Gujjar community, chairperson of RLEK, was invited to address and chair at the World Summit organized by United Nations on Information and Technology in Geneva, a group of Van Gujjar minority community also accompanied to Geneva and addressed world summit. The impact of the wireless communication has been manifold apart from providing security to the community it has led to their empowerment in the true sense.In cases of illegal poaching, medical emergencies, forest fires it has been a lifesaver. Apart from this it has increased the self worth and confidence level of the Gujjars and empowered them in that sense. They have started demanding basic services from the government. Now, the organization wishes to take latest mobile and other new technology to these groups for their overall development. 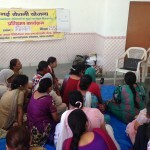 RLEK in keeping with the times introduced information and communication technology to the Van Gujjar community. They were trained to use 100 battery–operated wireless handsets, provided by the ministry of telecommunication. This is the first time that such communication technology was provided to Van Gujjar nomadic community in the country. This quick mode of communication had been useful in tracking poachers, illegal wood contractors/forest mafia, controlling forest fires and other natural calamities besides helping the nomads in medical emergencies. About 100 wireless sets operating in the two wireless frequencies, 167.25 MHz and 167.725 MHz, allocated by the Ministry of Telecommunication, are being used by the members of the community. In the area of social understanding, the right of Van Gujjars to lead a life of dignity in their forest home of centuries has been consistently championed and advocated.